I have been taking pictures of wristwatches for quite a while. 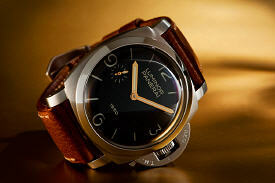 Mostly to post pictures on watch boards like paneristi.com and timezone.com. I was introduced to off-camera flash photography by a fellow Dutch Panerai and photography enthusiast a few months ago and I think I haven't taken a watch photo without using this technique ever since. The website strobist.com is dedicated to taking photos with small flash units. I've picked up many of the things I do there. Their site is about off-camera flash photography in general, not about watch photography in particular. But, there are a few interesting posts about that subject too. I've found that one of the biggest advantages of using flash for wristwatch photography is that the white balance is always spot on. For some reason I never seemed to get it right before and I always had to tweak the white balance in Photoshop Camera Raw. Have a look at this if you want to jump on to an example including a lighting setup diagram. Basically the technique is quite simple. You need some form of triggering for your speedlights and there are many options for that. I personally use a Nikon SU-800 on my camera's hot shoe to fire my flashes through infrared signals. The SU-800 is a great little gadget that has one big advantage over using other means of wireless triggering: the flash units (provided that these are Nikon made) communicate with your camera's metering system. Nikon calls this CLS, which is short for Creative Lighting System. There's much information available about CLS on Google. 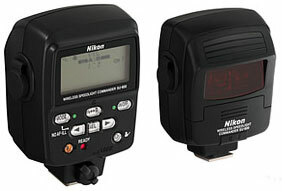 You can control 3 different speedlights from the unit without having to touch any of your speedlights during a shoot. There's a great tutorial about how to use your SU-800 on strobist.com. Ken Rockwell's website also has a good tutorial about this subject. Off-camera flash offers far more creative possibilities too. The results just look more professional and more three dimensional. Have a look at the picture below. To achieve this effect, I placed the watch (my PAM127) on a sheet of gold colored glossy art paper. There's a wine glass on the right and slightly behind of the watch and I fired one of my speedlights through that glass to create the lighting effect on the background. A second flash was positioned on the left of the camera to bring out some detail in the strap and a third flash was positioned on the right of the camera to emphasize the sides of the domed crystal of the watch. I always set my camera (a Nikon D700) to manual and I start with selecting an aperture that allows me to get the result I'm after for a particular photo. Basically it comes down to a small aperture (f16 or smaller) for more depth of field or a wide aperture to throw the background out of focus. Of course the actual aperture setting that you need also depends on other factors, for instance the distance between your subject and the lens. I've found that the shutter speed really doesn't matter that much when photographing a still object with off-camera flash. I use a slower shutter speed when I'm using a small aperture or when I want more of the background to show, usually 1/30th. With a wider aperture I sometimes go up to 1/125th. I also adjust the output of my flashes depending the aperture settings that I'm using. With a small aperture you need to increase the output power. It's really not that complicated. The slideshow below has images that I've stored on flickr.com. All of these wristwatch photos were taken using the technique described in this post. I hope this is useful information. Don't hesitate to ask if you any questions. wow your photos are awsome. So decent and professional. Love the shot with the wrist in the water. Do you have some pictures of your lightning setup ? I think it is quite a very good passion the people had the passion for the watches and people had the passion for the photogrphy but i think its the combination of both and very artistic as well. The concept you used for that watch photography was really appreciable. That wine glass trick was really nice. Nice, I just discover that wristwatches can be so impressive even in simple angles very impressive.